In those early days my Kiwi would take me to pubs in Broome favoured by fellow ex-pats and I was delighted to crow and prance and dance with every Australian win. 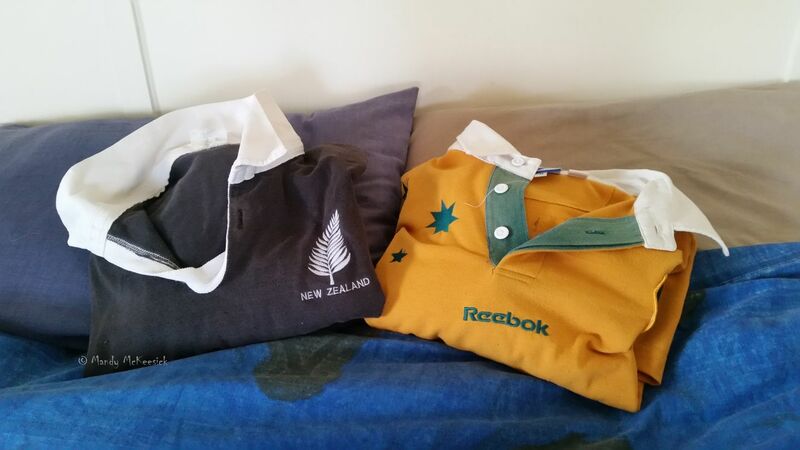 By 1995 my Kiwi and I were married and living in Karratha and the RWC was a bit of an upset. The bloody Poms beat the Wallabies in the quarter finals. The Poms then got a flogging from the All Blacks in the semis. The All Blacks then lost to South Africa in the final – though to this day they claim it was a dodgy burger that brought them undone. Despite the tilting of the natural order my eyes fell upon the new Australian half-back and love bloomed. Ah George. 1999 and my Kiwi and I were abalone diving in southern NSW and George Gregan was proving to be a nuisance to the All Blacks. France did their bit by knocking out the Kiwis in the RWC semi-final and George beat France to restore the natural order. 2003 and I had got off the abalone boat and was working with a Pommy accountant. The Wallabies were being described as the Wobblies and George and coach Eddie Jones were given long odds for the RWC semi against the All Blacks. My Kiwi dragged me to a Kiwi stronghold in Mallacoota and to my frenzied delight George stood over a prostrate New Zealand team and cried “Four more years boys, four more years” as the Wallabies reigned supreme. Amongst the vanquished was a rising All Black star by the name of Richie McCaw, but “pff” I may have thought – “he won’t amount to much.” The final was an agonising defeat in extra time to the bloody Poms and going to work on Monday was hideous. 2007 and my Kiwi and I were at Rocky Springs but the RWC was a non-event. George lost to the bloody Poms and Richie lost to his nemesis France in the quarter finals. At least South Africa beat the Poms in the final. 2011 and my Kiwi and I were still at Rocky Springs but George had retired and I had lost interest in rugby. I entertained myself for the three lead up weeks of the RWC by singing a song about Richie and the All Blacks with the memorable line of “we’re flogging everybody then we go and lose to France.” It wasn’t quite so funny in the final in Auckland when it looked like they were going to lose to France – and consequently be publicly shot – but Richie prevailed by one point. 2015 and my Kiwi and I are helping Col with his barley harvest. The days are long and the RWC is telecast at 3am so the nights are longer. The tournament starts out well with the Wallabies kicking the Poms out of the pool (oh, sweet 12-year-old revenge) but Richie is on fire and gives France an absolute flogging in the semis. The final comes down to Australia and New Zealand and I search desperately for George (surely he has come out of retirement for this) but alas, I can only watch, bleary-eyed, as the All Blacks get their hands, once more, on the Web Ellis trophy. The natural order is no more. To compound the misery my facebook account has been hacked and I am now getting regular Richie updates. Can someone please find me George? This entry was posted in Random Ramble and tagged 2015 RWC Final, Aussies vs Kiwis in rugby, George Gregan, Richie McCaw, rugby world cup. Bookmark the permalink. Ha Ha Jo. If you wrote a post about Aussie Rules I would have no idea either! The next RWC is in Japan so we might start saving – I have heard George may be there. There’s nothing quite like cheering for your team to bring on heartache. But you’re really asking for trouble when you marry the enemy! As we say around here it always seems to be next year country. Well I certainly got trouble! Do you play rugby union in Canada? If someone does I don’t know about it. I’m too busy watching hockey. Well Lyle after extensive research I have found some trivia for both of us. Canada does have a national rugby team (which has been in every RWC – I knew that!!) and Australia has a national ice hockey team (I didn’t know that). When I come visiting I expect an introduction to hockey on ice as opposed to hockey on turf, which is what I play. Sounds like you are happily encamped with the “them” side, and he even lives on your home turf! 🙂 I was never any good at hokey, ice or turf, but was a long distance runner and took part in track and field and cross-country. I wasn’t so good at the long distance but did OK in the sprints and relays. Comes in handy for chasing fox terribles. Totally with you Mandy. I also was in love with George (sigh) and clearly remember that final in 2011 when the ABs almost lost to France. You could see the passion in the Kiwis this year when they did the haka against the French and you knew that game was personal. It was probably my favourite match of the tournament. Luckily over in WA the matches were on a little earlier (midnight or 1am starts) but I was still pretty tired for quite a few weeks. I’m looking forward to 4 years time too, we may well beat them chaps over the fitch.